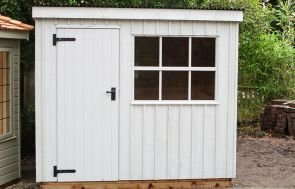 Installed at the bottom of our customer’s garden in Enfield, London, this National Trust Felbrigg Garden Shed is going to be used to store gardening equipment and rabbit bedding. The customer chose a building from the National Trust range because they wanted a traditional looking shed that would blend in seamlessly with their garden. 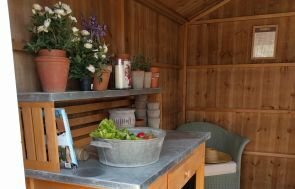 To help the shed blend in well with the customer’s garden, they opted for the paint colour, Terrace Green, which is a dark green from the National Trust paint range to go with the many different greens of the shrubbery and trees in their garden. At 1.8 x 2.4m in size, this is the smallest size of Felbrigg we make, but it is plenty big enough for the customer’s needs. The traditional features of the Felbrigg include the black corrugated material on the roof, Georgian style windows, cast iron door furniture, and the external cladding is formed of roughly cut, vertical boards to give a more rustic feel. 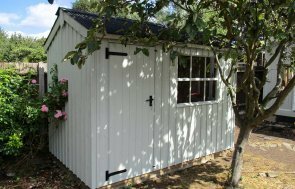 For more information on our range of Garden Sheds, you can Contact Us online, call us on 01760 444229, or visit one of our Show Centres across the country to view the quality of the buildings yourself.